Ready to be a member of The Spirit of Houston? CLICK HERE TO JOIN THE 2019-2020 BAND! The Spirit of Houston is the largest spirit organization at the University of Houston. 300+ members strong, The Spirit of Houston is comprised of the Cougar Marching Band, Color Guard, Twirlers, Cheerleaders, Mascots, Frontiersmen, and the Cougar Dolls Dance Team. The Spirit of Houston is an icon for the University, the City of Houston, and the State of Texas. The Cougar Marching Band performs at all home football games and travels to select away games throughout the football season. The “Spirit of Houston” performs for athletic games, community performances, private parties, pep rallies, parades, and other events. The program's pride is based on the tradition and history of the University of Houston and is displayed at UH athletic games in Houston and away, as well as other events, including it’s annual feature Spirit of Houston Benefit Concert. The Spirit of Houston has been featured in other performances and events including numbers bowl games, parades, the Super Bowl XXXVIII halftime show produced by MTV, multiple performances for the the Rotary Lombardi Awards, and the 100th Anniversary Birthday Celebration Concert with the Houston Symphony. Most recently, the band worked with Milby High School (HISD), Austin High School (HISD) Allison Orr of Forklift Danceworks to perform "Afoot – A Marching Band Extravaganza", a collaborative performance held in the historic East End district of Houston. Membership in The Spirit of Houston is an experience that instills quality characteristics vital to success in college and life. The organization is open to all University of Houston students of ALL MAJORS. 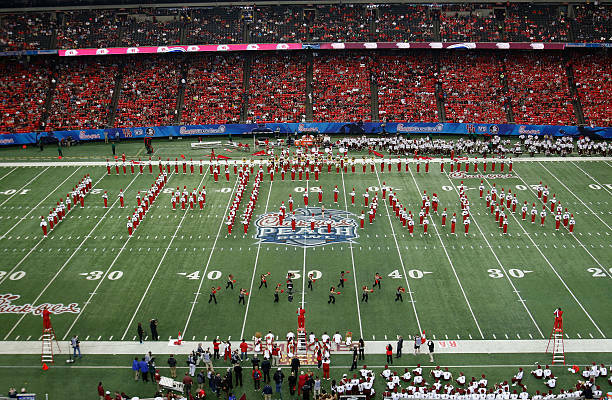 The Spirit of Houston is composed of a mix of music majors and 80 other majors. Every member in the marching band receives a financial grant for his or her involvement with the organization. The Spirit of Houston comes together for “Spirit Week” one week before school starts to prepare drill and music for the upcoming season.